Sorry, this entry is only available Japanese people. We will deliver the cloths donated by Japanese people to Uganda. Japanese people can directly support Uganda through this project. JICA project run by Rakuno Gakuen University found that subclinical mastitis is highly prevalent in Mbarara. One of the reasons is lack of hygienic cleaning teats before milking. To wipe teats properly, One Cloth or more should be used to clean udder for One Cow. 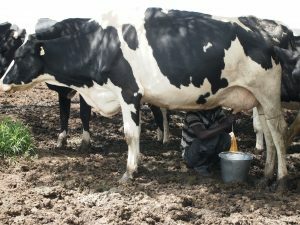 However, it is very challenging to do that for the farms milking cows far from cow shed equipped with piped water supply, and it is common that a milk man uses a dirty cloth to wipe udders of many cows, which spread contagious bacteria. To solve above mentioned problem, we propose to bring a set of clean clothes with milking technicians to the milking site. There a milk man can use clean cloth to wipe teats, and put the cloth used in an empty bucket. Hands are washed with clean water after milking each cow, before picking a new clean cloth. After milking, milk men can take all the clothes used back to farm, wash, disinfect, and dry incompletely. Slightly wet disinfected clothes are compiled in a bucket, which will be taken to the milking site on the day after. We named this “Mobile One Cloth One Cow(Mobile OcOc)”.